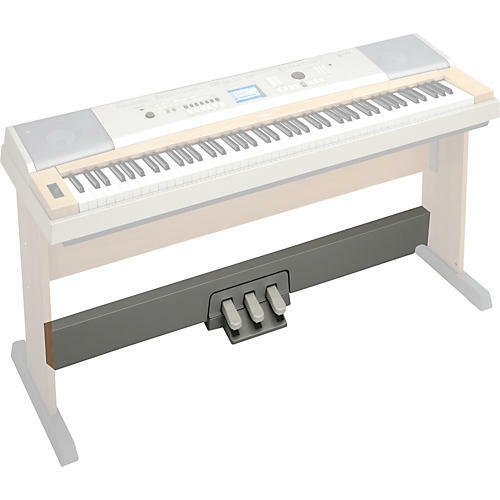 The LP-7 Pedal Unit for Yamaha YPG-635 electric piano is a 3-pedal unit that gives you virtually the same level of expressive control as that of actual acoustic grand pianos, including Half Damper effect, with more realistic control over the sustained sound. In addition to Damper, Soft, and Sostenuto control, the left pedal adds special control to the Classical Guitar and Sweet Muted Trumpet voices. Also works with the Yamaha DGX640 (#485991) and DGX630B (584332). Dimensions: 7" x 53.8" x 12"